Hello, Bloggers! 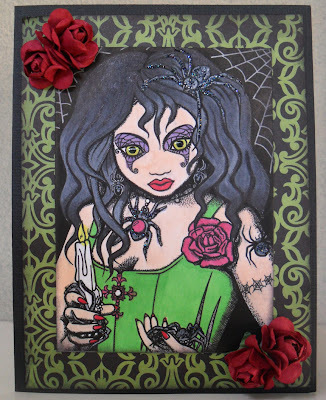 The latest challenge over at Digi Galore is GOTH, and we are sponsored by Delicious Doodles. For this challenge, I used the Black Widow digi. Isn't she so cool with all her spider friends? I colored her with Copics and accented the spiders with Black Stickles. I added Glossy Accents to her eyes to make them pop! I finished off the card by inking all of the edges with Black Soot distress ink and some goth red roses. For details on how to enter our challenge, be sure to pop by Digi Galore! Thanks for stopping by! Super Wonderful creation. Great JOB!